Chowderfest 2018 and The Brunswick at Saratoga: Eat, Sleep, Warm Your Bones. For 19 consecutive years, Saratoga Springs restaurateurs have brought hot, delicious chowders to hungry, freezing souls in the dead of Winter. Chowderfest offers Winter-weary spirits an opportunity to break the Cabin Fever Mold, and get out of the house. Drive up (or down) the Northway, or perhaps visit Saratoga for the first time. 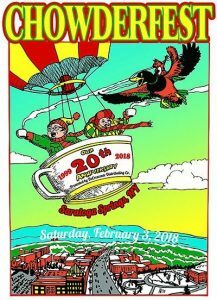 As in the 19 years before, Saratoga will again present Chowderfest: this year’s date and time are Saturday, February 3, from 11AM – 4PM. For a mere dollar per cup, Chowderheads can sample dozens of delicious, sweet, soul-warming chowders from most of Saratoga’s most renowned dining establishments. Wrap your hands and your hearts around these steaming mugs, and dive in. Then, vote for your favorite: it’s a major point of pride for the establishments who win Chowderfest accolades every year. After walking around Saratoga; shivering with your friends and taking notes on which chowder was best–you’ll be in need of a warm, cozy bed and hot cup of tea. A brief walk from downtown, or short drive. You may have been crowned, Queen of Chowder by your friends, for consuming the most cups–so you deserve to pamper yourself for all that hard work. (And if you’re not still stuffed in the morning, a piping hot, gourmet breakfast will await you in our dining room. Posted in Brunswick Bed and Breakfast | Comments Off on Chowderfest 2018 and The Brunswick at Saratoga: Eat, Sleep, Warm Your Bones. Flurry Festers: Dance, Sing then Sleep, Break the Fast in Our Welcoming Saratoga Abode. But one of the delightful breaks in the Winter madness (which quickly morphs into Cabin Fever) happens every year during Presidents’ Day Weekend. (An oxymoron, for sure: is it a DAY, or a weekend?) Regardless, it’s not really a tradition to pick up and go somewhere for Winter fun to celebrate the Presidents who are honored in February (can you name them, BTW? )–but, in 1994 the Dance Flurry Organization moved their annual folk/social dance festival to Saratoga–Presidents’ Day Weekend became a cause to celebrate. Contact us at (518) 584-6751, and let us help make this one detail of your Dance Flurry Weekend easier. Check in on Friday, and walk to Flurry events all weekend. (With Saratoga parking, it’s a boon to be able to park your car in our lot, and leave it.) We’ll happily accommodate dietary restrictions (gluten, etc. ), and serve up the most elegant and filling breakfast in Saratoga each of the mornings you awaken in our little slice of Heaven. We look forward to meeting you, and celebrating with you, the joy that only dance can instill in the human spirit. 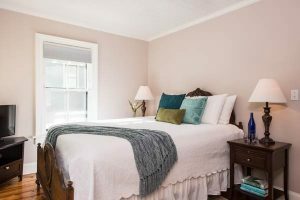 Posted in Brunswick Bed and Breakfast | Comments Off on Flurry Festers: Dance, Sing then Sleep, Break the Fast in Our Welcoming Saratoga Abode.